In January 1941, Josef Jakobs received wireless training in The Hague prior to being sent on his espionage mission to England. During his interrogation by MI5, he was asked many questions about the German Abwehr's activities in The Hague, most of which he could not answer. He did admit that the wireless training took place in a flat in the Vondelstraat. The exact address, however, was unclear. When Karel Richter arrived at MI5's interrogation centre, he too admitted to being trained at a flat in the Vondelstraat. By piecing Karel and Josef's statements together, we can circle a bit closer to an exact location for the flat. This last bit of information is quite helpful in untangling the issue. Given that the Vondelstraat runs in an east-west direction, we can be quite certain that the flat's address was on the north side of the street, near the west end, where the Vondelstraat meets the Elandstraat. A bit of digging confirms that the buildings on the north side of the Vondelstraat were constructed in at least two stages in the 1930s and early 1940s. The image at right was taken in 1929 and looks in a westerly direction near where the Vondelstraat bends towards the west. One can see the ends of the houses that line the intersecting Bilderdijkstraat, Tollensstraat and 2e de Riemerstraat. There are no apartment buildings lining the north side of the Vondelstraat. 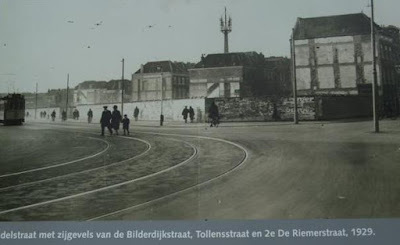 It is unclear from the image if apartment buildings existed along the south side of the Vondelstraat (left side of the photograph). Six years later, in 1935, we find a very different picture. The image at left, was taken from the western end of the Vondelstraat looking towards the east (opposite to the image above). One can see a long row of apartment buildings lining the south side of the street (right side of the image) as well as some buildings at the far end of the north side of the street. Based on the identical architecture of the buildings, it would appear that the apartment buildings on both sides of the street were built around the same time. Along the north side of the Vondelstraat, the apartment buildings from Bilderdijkstraat to 2e de Riemerstraat look identical to those along the south side of the Vondelstraat. The Huispedia site notes that several flats were constructed in 1930 which would be expected. based on the above images. The image below is from the north side of the east end of the Vondelstraat - note the windows on the ground floor, the doors and the concrete blocks above the doors. The image below is from the south side of the east end of the Vondelstraat - note the windows on the ground floor, the doors and the concrete blocks above the doors. The only difference between the south side and the north side is that the concrete blocks on the south side above the doors appear to have more moss and mildew staining, to be expected given that the they face towards the north and get less sun exposure. As for apartment numbers, the north side of the Vondelstraat has odd numbered units. The block just east of the 2e de Riemerstraat has flat numbers 93 to 105 and the numbers decrease towards the east. The first door on the north side of the Vondelstraat, near the Bilderdijkstraat is numbered 5 to 15. The flats on the south side of the Vondelstraat have even numbers. The question then becomes, when was the last section of apartment buildings on the north side of the Vondelstraat (west of the 2e de Riemerstraat) constructed? Were they built by January 1941 when Josef and Richter received their training? The Hague - Vondelstraat - looking east from the intersection with Elandstraat. flats on the left were constructed in 1940/41. The image at right was taken from the western end of the Vondelstraat looking towards the east. From the photograph, one can see that the last section of flats on the north side of the street (left of the photograph) have been constructed. A comment on the photograph noted that: "The flats at left were completed in 1940/1941." The Huispedia site also notes that 131 Vondelstraat was built in 1940. It would then seem quite clear that Josef and Karel received their training at 131 Vondelstraat. But there is a slight hiccup. Richter had said that the flat was the second to last door before the small plaza where the Vondelstraat meets the Elandstraat. 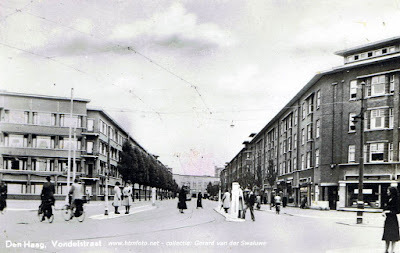 If one walks down the north side of the Vondelstraat from 2e de Riemerstraat towards the Elandstraat, there are six entrance doors to the "new" section of flats (constructed 1940/41). The second to last entrance door bears the flat numbers 173 to 187. The entrance door for flats 125 to 139 (including 131) is actually the second door after the 2e de Riemerstraat or the fourth door from the intersection with the Elandstraat. Two possibilities would seem to present themselves. Perhaps the "new" block of flats were constructed in two sections. The first building west of the 2e de Riemerstraat (with the first three entrance doors, the middle one of which is 125-139) may have been constructed in 1940 and therefore the door for 125 to 139 would have been the second to last door before the intersection with Elandstraat. The last block of flats (with the last three entrance doors) could have been constructed afterwards. The Huispedia site, however, notes that flat 173 (which would have been the second entrance door in the second block) was constructed in 1940 as well. The other option is that the "new" section was present in its entirety in January 1941 and that the second to last door was the actual door of the wireless training flat, in which case it would have been an odd-numbered flat between 173 to 187, and much closer to Josef's recollection of it being flat #184. Short of tracking down the building permits for the "new" block of buildings, it would seem that the exact flat in which Josef and Richter received their wireless training will remain a mystery. Despite this, it is a bit eerie to walk down the Vondelstraat knowing the history of at least one of these buildings. I have considered the possibility that the flats have been renumbered since 1941, but this seems unlikely given my experience with buildings in Germany. Unless the buildings were destroyed during the war, most tend to keep the same numbers over time.